Garland Children Soon to Enjoy Enrichment & Tutoring Center Beloved by More Than 100,000 Students in the U.K. Explore Horizons, the premier British children’s enrichment and tutoring organization, that currently operates over 115 locations in the U.K, today announced the official launch and ribbon-cutting ceremony of their forth Dallas-Fort Worth location as they continue their expansion in the U.S. Following the successful opening of their first three U.S. education centers in Colleyville, Alliance Town Center and Plano last year, Explore Horizons are excited to be launching their first 2015 location! The new Garland center is located at 5129, North Garland Avenue, conveniently located within Firewheel Place and nearby to Firewheel Town Center. The ribbon cutting ceremony is set for October 20 at 4pm and will be hosted at the Garland location by Explore Horizons and the Garland Chamber of Commerce. Parents are invited to enjoy refreshment, and meet the Explore Horizons team, and local community leaders, while their children engage in fun and interactive math, reading and writing activities. Explore Horizons centers provide math, reading & writing enrichment and tutoring for children in Pre-K through 8th grade of all abilities. The curriculum is tailored to each child’s individual needs and is designed as an on-going supplement to a school education. Many courses are aligned to the Texas Essential Knowledge and Skills, but Explore Horizons also places importance on challenging children beyond the school curriculum where appropriate. Whether children are finding school challenging or they are at the top of the class, Explore Horizons aims to help children to gain confidence, make academic progress and enjoy learning. More centers are planned throughout Texas, with further growth in progress across America and the globe. Proof of the success of Explore Horizons in Dallas – Fort Worth comes from a huge amount of positive feedback from parents. One such parent is Maria Veces the parent of Paula who first joined Explore Horizons in May 2014. “The service provided by the tutors is excellent. Their enthusiasm is contagious and makes my child feel energized to learn. They make learning fun! My child is benefiting from the educational reinforcement she needs and the family are benefiting from the flexibility that they need,” said Veces. Explore Horizons is open 7 days a week and through school vacations which is appealing to many busy families in the metroplex. Key findings from Dr. Ellie Francis-Brophy and Dr. Christian Nygaard also proved that “Explore is beneficial to boys and girls of all abilities across all age ranges, including those living in a wide variety of socio-economic areas.” Interviews with parents revealed a huge difference in attitude as well as test scores. Parents noticed children overcame shyness, built confidence, became more independent, and were less reluctant to try new tasks without assistance. For more information, to attend our ribbon cutting, or to schedule a free trial session for your family, visit https://www.explore-horizons.com/ or contact the Garland team on (469) 398 – 1975. Explore Horizons centers provide tutoring and enrichment in math, reading, and writing for Pre-K through 8th grade children. Students of all abilities and backgrounds are welcome, including gifted students, those studying English as a second language and those that are finding school a challenge. All new Explorers undergo ongoing assessment to ensure programs are customized for every need. Students love the interactive lessons, encouragement, and rewards, and parents and teachers love the huge difference they see in grades and attitudes towards learning. Explore Horizons was founded in 2001 by Cambridge University mathematics graduate Bill Mills. It currently operates more than 115 centers in the U.K. that teach over 100,000 students. 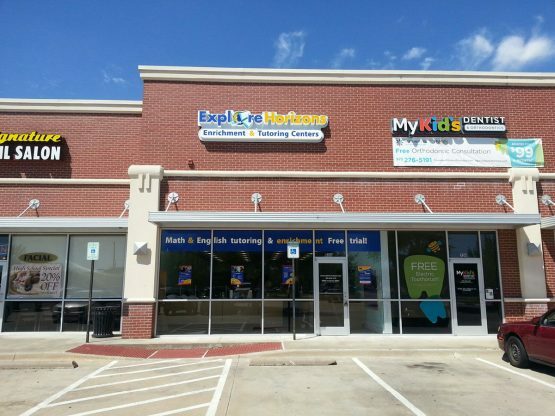 The first center in the U.S. opened in Colleyville in March 2014. Plans to open centers throughout the United States and the globe are underway. More information can be found at https://www.explore-horizons.com/.